St. James, the brother of St. John the Evangelist and son of Zebedee and Salome, was called the Greater to distinguish him from the other apostle of the same name, referred to as James The Less, perhaps because he was taller in stature or older in age. It is believed that St. James the Greater was born about twelve years before Jesus, and was much older than St. John. Salome was the sister of the Blessed Virgin Mary, the mother of Jesus Christ. St. James was a Galilean fisherman, who with his father and brother, were probably living in Bethsaida where St. Peter also lived at the time. Jesus walking by the Lake of Galilee saw St. Peter and his brother St. Andrew fishing and He called them to come after Him promising to make them “fishers of men.” Continuing along the shore of the lake, he saw James and John, in a ship with Zebedee their father, mending their fishing nets; Jesus also called them to follow Him. They too left their nets and their father and followed Him. It is believed that before receiving their call, all four fishermen had come to the conviction that Jesus was the Christ. St. Peter, St. James, and St. John were privileged to have been chosen to behold the Transfiguration of our Lord Jesus Christ, and to witness the healing of St. Peter’s mother-in-law and the raising of the daughter of Jairus from the dead; these three apostles were also called aside to watch and pray with Jesus, in the garden of Gethsemane, on the night before our Lord’s death. In the Year 44 AD, shortly before Passover, St. James was beheaded by order of King Herod Agrippa I, grandson of Herod the Great (who had tried to kill the infant Jesus). James The Greater was the first of the Twelve Apostles to suffer martyrdom, and the only one of the Twelve whose death is recorded in the New Testament. Although disputed by some, tradition has it that St. James had made a missionary journey to Spain, and that after his death and initial burial, his body was miraculously taken to Spain and re-buried at Compostela in Spain. Many images of St. James represent him as a well-equipped medieval pilgrim with an ample cape, sturdy boots, a broad-brimmed hat, and a walking stick with a hook for hanging a drinking gourd. The hat is often adorned with a scallop shell (or “cockle shell”) which the Compostela pilgrims used as a type of heraldic device for more than one thousand years. James A. Bradley was born on February 14th 1830 on Staten Island. At the age of 16, he became an apprentice brush maker for the Bernalds and Weeks Company of New York City. In 1857 (at age of 27) he started his own brush making business, Bradley and Smith, in New York City. Mr. Bradley was married (wife: Helen) but had no children. After the Civil War ended in 1865, a Methodist religious retreat was founded in Ocean Grove, NJ. Methodists from New York City and northern New Jersey were drawn to Ocean Grove to participate in religious retreats, and many spent much of their summers in Ocean Grove enjoying the seashore and cool breezes away from the hot cities of their homes. James Bradley, who had been born Catholic but converted to Methodist, and William Bradner, a rich businessman from Newark, were among the regular visitors to Ocean Grove. In a short time, James Bradley developed a close relationship with the leaders of the Ocean Grove Camp Meeting Association. On January 24th 1871, Mr. Bradley acquired approximately 500 acres of land located east of the New York and Long Branch Railroad, between the Deal and Wesley lakes. He named the community Asbury Park after Francis Asbury, the founder of Methodism in the United States. Mr. Bradley served as the first postmaster of Asbury Park (1874 to 1884), and started its first newspaper in 1876. He established the city’s first sewerage system in 1881, and the first water and gas works in 1884. In addition to serving as mayor and councilman of Asbury Park, Mr. Bradley was elected to the N.J. Senate in 1894. Both Mr. Bradner and Mr. Bradley bought many acres of land to the south of Ocean Grove. Mr. Bradley had hoped to extend the temperance and religious convictions found in Ocean Grove to the neighboring areas. Although Mr. Bradley’s religious ideals never took hold, the resort area did develop into democratic, family oriented communities – an alternative to the nearby elite resorts such as Deal or Allenhurst. A new community, originally named Ocean Park, was established immediately south of Ocean Grove. However, the U.S. Postal Service asked that the name of the new community be changed to avoid confusion with the Borough of Oceanport, also located in Monmouth County. Mr. Bradner asked that the name of the new community be changed to Bradley Beach, in honor of his good friend James Bradley. A reminder of the original name for the community continues to exist today in the form of Ocean Park Avenue, a beautiful street running from Main Street to Ocean Avenue. At the turn of the twentieth century, railroads were bringing visitors to the Jersey Shore; businesses were flourishing and trolleys were running between Long Branch and Belmar. The first Episcopal services in Asbury Park were held in 1873 in Mr. Bradley’s main office. In 1874, he donated land at the corner of Asbury and Grand Avenues to build Trinity Episcopal Church. In May of 1911, a series of meetings of Episcopalians, who were both members of Trinity Church in Asbury Park and residents of the rapidly growing shore communities in the immediate area of Bradley Beach, were convened to discuss the feasibility of establishing an Episcopal Church in Bradley Beach. There is reason to believe that these meetings were encouraged by Mr. Bradley because he wanted to develop the communities neighboring Ocean Grove into communities having strong religious traditions. The first Episcopal services in Bradley Beach were held initially in homes and later in vacant buildings on La Reine Avenue, near the railroad. Impressed by the dedication of the members of that group, Mr. Bradley donated land at the corner of Fourth and Hammond Avenues in Bradley Beach, to the St. James Mission, for the construction of a church building that would provide a more appropriate venue for worship services. On January 14th1917, St. James Episcopal Church in Bradley Beach was dedicated to the honor and glory of God. Mr. James Adam Bradley died in New York City on June 6th1921 at the age of 91 years. He was a philanthropist who shared his wealth, and he had lived a full and exemplary life. It is a matter of legal record that Mr. Bradley’s heirs included twenty-one Churches (including St. James Church) and various Religious Organizations (located in Asbury Park, Bradley Beach, Avon, and Neptune), four Homes for the Aged, three Hospitals, and six Community Organizations. The Parishioners of St. James Church are forever grateful for his vision, support, and generosity. The Reverend Charles Holland Kidder, D.D. During the period leading up to the establishment of the St. James Mission in Bradley Beach, the Reverend Charles Holland Kidder was retired from the active priesthood and residing in Asbury Park at 512 Summerfield Avenue. Born on December 27th 1846, Father Kidder was ordained a priest in 1877 after graduating from the Philadelphia School of Divinity. During his active priesthood, which spanned the period from1877 to 1902, Father Kidder served as either Rector or Assistant at twelve different churches located in five States – Pennsylvania, New Jersey (Asbury Park, Point Pleasant, Perth Amboy, and Ridgefield Park), Washington State, Wisconsin, and Delaware. All of his assignments were short – one to three years in length. His tenure in Asbury Park was from 1885 to 1888, when he served there as an Assistant to the Rector. Although retired, Father Kidder actively supported the conduct of religious services in Bradley Beach during the initial 1911 to 1914 time period. Father Kidder also served as the first Missionary-in-Charge of the St. James Mission during the first month after the official establishment of the Mission. In October 1916, Father Kidder assisted Archdeacon R. Bowden Shepherd during the services held to commemorate the laying of the cornerstone for the new St. James Church. When St. James Church was dedicated in January 1917, Father Kidder assisted the Reverend John J. Neighbor, then Missionary-in-Charge of the Mission, during the dedication services. Father Kidder often celebrated the Eucharist at St. James Church during the early days of its existence. The Reverend Charles Holland Kidder, D.D., died in 1929. It is therefore most fitting that one of the oldest stained glass windows in the Nave of St. James Church (entitled “Ascension”) is dedicated to the memory of The Reverend Charles H Kidder. The donor of that window is unknown. The driving force for the establishment of an Episcopal Church in Bradley Beach, N.J. was not an initiative by one or two people but rather an initiative by eight or ten families. The contributions and work of the John P. Van Kirk family, who resided at 612 Evergreen Avenue in Bradley Beach, was particularly significant and their story must be told. The first recorded activities of the Van Kirk family occurred during 1915 when Mrs. Van Kirk succeeded Mrs. Brearley as president of the Women’s Guild. Later in the same year, a “parish meeting” was held on September 27th 1915, in response to a visit made to the Mission by Archdeacon R. Boyden Shepherd on September 25th – at which time the congregation was informed of Bishop Paul Matthews’ view that a “permanent building committee” should be formed. At the subsequent meeting of the congregation, attended by 21 people, Mrs. Van Kirk took the lead by making a motion “that a permanent building committee be elected by ballot, to consist of ten persons who should have power to proceed as rapidly as possible with building operations.” Due to the closeness of the ballot results (eight persons received more than ten votes, and three persons received ten votes), Mrs. Van Kirk offered an amendment to her motion increasing the number on the Committee to eleven persons. In addition to The Reverend John J. Neighbor, the Committee included six men and four women. Two families from Bradley Beach were represented on the committee; namely, Mr. and Mrs. John P. Van Kirk and Mr. and Mrs. William T. Sherman. At the Annual Meeting of the Mission Advisory Committee, held in December 1916, John P. Van Kirk was elected to the post of Secretary, and at the following Annual Meeting in December 1917, Mr. Van Kirk was elected to serve as Treasurer. He continued to serve as Treasurer until the November 29th 1926 Meeting when he was elected to the post of Warden. His leadership was clearly recognized and accepted by the congregation, as evidenced by the fact that through re-election after re-election he continued to serve as Warden until his death in early 1937. At its Meeting on May 30th 1937, the Mission Advisory Committee acknowledged the great contributions of Mr. John P. Van Kirk and also passed a Resolution of Thanks to Mrs. Van Kirk, and son Russell, who had donated the “St Andrew’s Window” in memory of their husband and father. In 1938, Mrs. Van Kirk was elected to serve on the Mission Advisory Committee, and was also re-elected to the Committee in 1939. (Mrs. Van Kirk also had filled unexpected vacancies on the Committee that arose during 1932 and 1933.) Mrs. John P. Van Kirk continued to actively support the St. James Mission and Parish well into the 1950s as Directress of the Altar Guild and Chairwoman of the Card Club. In May of 1948, the beautiful “Christ the Comforter” stained glass window, a memorial to Russell Van Kirk that had been donated by his wife, was dedicated by Father Hadley. “Vakumatic” cushions for the kneeling benches were donated by Miss Joan Van Kirk in October 1948. In February 1949, Mrs. John P. Van Kirk donated the materials for a new set of red Eucharist vestments which were sewn by the members of the Altar Guild. In October 1949, she donated new massive oak doors of an ecclesiastical design, with appropriate hardware, to replace the aging entrance doors to St. James Church. In late 1952, Mrs. Van Kirk donated a new altar in memory of her son Russell, which was dedicated by Father Hadley on December 21st 1952. Over the years, many other gifts were donated to St. James Church by Mrs. Van Kirk. Clearly, the family of Mr. and Mrs. John P. Van Kirk must be considered a “Founding Family of St. James Church.” Their work, generosity, and steadfast dedication in support of St. James Mission and Parish were exceptional and substantially contributed to the successful establishment of the Parish in Bradley Beach, which they and the other congregants in 1911 had so much desired, and had worked so hard to obtain. St. James Mission was particularly blessed by having the strong support of a Diocesan Bishop having great energy, vision, and enduring support for the missionary work of the Episcopal Church. The Reverend Paul Matthews was consecrated the 5th Bishop of the Diocese of New Jersey on January 25th 1915. Almost immediately thereafter, Bishop Matthews became directly involved in the work to establish the St. James Mission in Bradley Beach; the Mission being officially organized on February 16th 1915, just a few weeks after his consecration. He immediately asked the congregants to elect a Warden, Treasurer, and Secretary that he could appoint to manage the activities of the Mission. On July 7th 1915, Bishop Matthews and Archdeacon Shepherd visited Bradley Beach to inspect the lot, at the corner of 4th and Hammond Avenues, which had been donated by the Honorable James A. Bradley for construction of a church for the Mission. During that visit, Bishop Matthews also gave the congregation a set of plans that could be used for the construction of a Rectory. Immediately after the visit, Bishop Matthews sent a personal check for $500 to the St. James Guild as a personal contribution to the Building Fund. On August 22nd 1915, only six months after establishment of the Mission, Bishop Matthews made a formal visitation to the St. James Mission at which time he confirmed a class of twenty-two people, mostly adults. This must have been one of the first visitations of his episcopate. During a special meeting with a delegation from St. James Mission, held in mid-November 1915, Bishop Matthews informed the delegation of his decision to sign the Contract and Notes which enabled construction of the St. James Church building to commence. Bishop Matthew’s interest in the well-being of St. James Mission continued even after his retirement as evidenced by the fact that he visited the St. James Mission on December 3rd 1939 to attend a Eucharist Service. Without a doubt, Bishop Matthews had a very special interest in the success of the St. James Mission and the welfare of the congregation of the Mission. Paul Matthews was born in 1866, the son of Thomas Matthews a U.S. Senator from Ohio and an Associate Justice of the U.S. Supreme Court. Following graduation in 1887 from Princeton University, as valedictorian of his class, and from the General Theological Seminary in 1890, he was ordained a priest in 1891 by Bishop Worthington of Nebraska. After serving at an Associate Mission in Omaha from 1891 to 1895, he served as Rector of St. Luke’s Church in Cincinnati from 1896 to 1904, dean of St. Paul’s Cathedral in Cincinnati from 1904 to 1913, and dean of the Cathedral of Our Merciful Savior in Faribault, MN from 1913 to 1914 (and professor at the Seabury Divinity School during the same period) prior to his election as the 5th Bishop of Diocese of New Jersey. In May 1897, Father Paul Matthews married Miss Elsie Procter, whose grandfather had founded the Procter and Gamble Company. Both the Matthews and Gamble families had a strong interest in the missionary work of the Episcopal Church. In 1922 and 1923, the Matthews family donated 160 shares (100 shares by Bishop Matthews) of Procter and Gamble stock to a trust fund managed by the Bishop of the Philippines. In 1961, the shares had a value in excess of $491,000 and were used to establish the Trinity College of Quezon City. Bishop Matthews and his wife were also instrumental in founding the Princeton Nursery School. Bishop Matthews and his wife lived in Princeton for forty-two years, in a private home that included a small chapel, on the third floor, that was built by Bishop Matthews. Harriet Procter Matthews Fund (in honor of his daughter). Bishop Matthews retired in 1937 at the age of 71 years; he died seventeen years later in 1954. Archdeacon R. Bowden Shepherd provided the critical initial lifeline between the Episcopal Diocese of New Jersey and the small group of congregants who wished to establish an Episcopal Church in Bradley Beach. The initial contacts were established between Mr. Spencer Brearley, who had served as the Acting Chairman of the group of Bradley Beach congregants, and Archdeacon R. Bowden Shepherd who represented the Diocese’s Board of Missions. When the decision was made by the Diocese in February 1915 to establish the Mission in Bradley Beach, it was Archdeacon Shepherd who presented the facts associated with the proposal. It was also Archdeacon Shepherd who informed Mr. Brearley of the Diocese’s decision and who requested that a meeting of the Bradley Beach congregants be convened at the earliest possible time to select the men to be recommended to Bishop Matthews for his appointment to the positions of Warden, Treasurer, and Secretary of St. James’ Mission Advisory Committee. Archdeacon Shepherd also made the arrangements necessary for assignment of clergy to serve as the initial Priests-in-Charge of the St. James Mission. So, it was most fitting that Archdeacon R. Bowden Shepherd would be chosen to lay the cornerstone for the new church building, and to conduct the associated religious service. Archdeacon Shepherd also attended the formal dedication ceremony three and one half months later, at which time he congratulated the congregation on their ability to erect such an edifice in such a short period of time (less than two years from the start of the entire process). Of course, all attending the ceremony knew, and deeply appreciated, the important role that Archdeacon Shepherd had performed. Archdeacon R. Bowden Shepherd was born in Yonkers New York and graduated from the University of Pennsylvania and the Berkeley Episcopal Seminary at Yale. He was ordained to the priesthood in 1882. He served as the First Rector of Trinity Church in Philadelphia, PA from 1882 to 1885, Rector of the Church of the Advent in Kennett Square, PA from 1885 to 1892, and Rector of Christ Church in Riverton NJ from 1894 to 1911. He was appointed Archdeacon in the Diocese of NJ in 1911, a post he held until his death in 1927. During his tenure as Archdeacon, he served as a Trustee for a Foundation and a Trustee for a Building Fund; he was also the Editor for “The Diocese of New Jersey” publication. The R. Bowden Shepherd Trust Fund, established on March 5th 1928 under the terms of his Last Will and Testament, and which continues in operation to this day, is designed to enable the Diocesan Council to make loans from the principal of the Fund, on proper security, at 5% interest per year to Mission and Assisted Parishes in the Diocese of New Jersey. Archdeacon Robert Benjamin Gribbon also played a very important role, perhaps even a critical role, in the transition of the St. James Mission to the long-desired status of a self-sustaining Parish in the Episcopal Diocese of New Jersey. Reverend Robert B. Gribbon, despite his relatively short tenure as a priest, was appointed to the position of Head of the Diocesan Board of Missions and elevated to the rank of Archdeacon in 1937 shortly before the retirement of Bishop Matthews and his succession by Bishop Wallace Gardner. Recognizing Bishop Matthews’ strong personal commitment to the success of the St. James Mission, and Archdeacon Gribbon’s special background and experience, both prior to and after his ordination, it is clear that Bishop Matthews firmly believed that Archdeacon Gribbon had the special skills required to achieve the St. James transitional objectives. Almost immediately after his appointment, Archdeacon Gribbon found himself immersed in trying to sort out the difficult financial situation that had emerged due to the inability of the Mission to pay bills for repairs, utilities, and services for its physical plant; in addition, the Mission was months behind in paying the salary due to Father Walenta, then serving as priest-in-charge of St. James Mission. By February 1939, Archdeacon Gribbon had prepared an agreement between the Diocese and Father Walenta on how to resolve the indebtedness of the St. James Mission. In addition, Archdeacon Gribbon agreed to accept Bishop Gardner’s invitation to take over as priest-in-charge of the Mission, effective March 1st 1939. A new pledge campaign, designed and established by Archdeacon Gribbon, was pursued vigorously with personal visits to the homes of the congregation made by Archdeacon Gribbon and the members of the St. James Mission Advisory Committee to discuss the needs of the Mission and the planned Way Ahead. One year later, in March 1940, Archdeacon Gribbon “reported on the splendid progress of the church operations” during a meeting he had with Bishop Gardner. Five months later, in August 1940, Archdeacon Gribbon and the Mission Advisory Committee unanimously agreed that the Mission had recovered from its past financial difficulties and that an experienced member of the clergy should be assigned to guide the Mission toward becoming a fully operational, and self-sustaining, Parish in the Diocese of NJ. Archdeacon Robert B. Gribbon was born in Belfast, Ireland on December 26th 1893. He attended private schools in Ireland and in the United States. In 1915, after completing his course work at Princeton University for a Bachelors degree, he left for travel and to enter into business before taking his degree. In 1931, he entered the General Theological Seminary of the Episcopal Church; he received an STB in 1932 and an STM in 1938. He was ordained a Deacon in April 1931 and a Priest in October 1931, by Bishop Paul Matthews. He served as Curate at the All Saints Chapel of Trinity Parish in Trenton from 1931 to 1935, Canon at Trinity Cathedral in Trenton from 1935 to 1937, and Archdeacon from 1937. He also served on many Boards and Committees of the Diocese, and edited the Diocese’s “Church News” for a number of years. Archdeacon Gribbon is officially recognized for “providing valuable criticism” on the first draft of a book entitled: “New Jersey A Guide to its Present and Past,” published in 1939 under the Federal Writers Project. Smaller, cheaper, and more portable than pipe organs, reed organs were widely used in smaller churches and in private homes in the late 19th and early 20th centuries. (It has been reported that several million reed organs were made in the United States between the 1850s and the 1920s.) In a manner similar to accordions, reed organs generated their sounds using metal reeds and pressure or suction bellows. Since reed organs with pressure bellows were more difficult to produce and therefore more expensive, North American and British reed organs generally used suction bellows and operated on vacuum. Most U.S. made reed organs had two complete sets of reeds and ten or more draw-knobs controlling various couplers and expression features. The main sets of reeds were usually divided into bass and treble sections controlled by two separate draw-knobs to allow varying tones to be created on each half of the keyboard. On all but the smallest instruments, there was also a mechanical stop which controlled a vacuum-powered fan to disturb the airflow over the reeds to create the desired vibrato effect. The Minutes of a Mission Advisory Committee Meeting indicate that the organ was received in late April 1915, overhauled, and “found to be a good instrument.” The organ continued in use at St. James until replaced by the Hammond Series-D organ. The Hammond Series D electromechanical pipeless organ was produced from June 1939 to November 1942 by the Hammond Organ Company, based on a U.S. Patent awarded to Laurens Hammond in April 1934. Essentially, it was a first generation electro-mechanical organ, which was sold to churches as a lower-cost alternative to the wind-driven pipe organs. The waveforms used to produce the organ sounds were generated by 96 mechanical tone-wheels that rotated in front of electromagnetic pickups. The Series D organ also included a Chorus Generator which employed a separate set of tone-wheels to vary the pitch of the organ slightly out-of-tune from the organ’s main tone generator. Production of the Hammond tone-wheel organs stopped in the mid-1970s. The Hammond Series D organ was equipped with two 61 note manuals (organ keyboards). In 1971, the Hammond Organ was replaced by an Allen analog electronic organ (Model TC-3S) for the regular religious services of St. James Church. However, the Hammond Organ was stored near the Sanctuary, and retained as a second organ for use during special musical arrangements performed by the Choir and directed by Father Alexy. The TC-3S pipeless Allen organ employed an analog electronic technology which differed fundamentally from the electromechanical technology used in the Hammond Series D organ. The Allen Organ Company, located in Macungie PA, is now the largest builder of church organs in the world. The founder of the company, Jerome Markowitz, originally from Jamaica, Long Island, built his first experimental electronic organ in 1936 after having become interested in electronic and radio technologies at an early age, and after gaining a passion for organ music. Markowitz built a number of oscillators (frequency generators) similar to those he had built for his radios and discovered that he could connect the oscillators to the keys of an organ keyboard. By doing so, he could build a pipeless organ; he then patented the technology that could create sound waves via an oscillator. In 1937, Markowitz’s parents moved to Allentown PA and Jerome set-up a workshop in their basement where he worked on improving the sound quality of his electronic organ to make it sound more like a pipe organ. Shortly thereafter, he moved his workshop to an empty section of his father’s textile factory. With the help of a maintenance man who was working at the factory, Markowitz designed and built his first analog electronic pipeless organ, the Allen No. 1, which was named after the city of Allentown. The organ was sold to St. Catherine of Siena Church in Allentown where it was used until 1953. The Model TC-3S Allen Organ was first produced in 1968; it included two manuals and played 61 notes. In 1969, the North American Rockwell Corporation contacted Mr. Markowitz about entering into a partnership to develop the world’s first digital electronic organ, using a large scale integration (LSI) digital circuit technology that Rockwell had developed. A prototype of a digital organ was produced in 1971, and the Allen Organ Company began marketing an Allen Computer Organ – Mr. Markowitz thought that the name “Computer Organ” would have more appeal to the public than would the name “Digital Organ.” By the 1980s, the digital electronic organ, which sounded more like a pipe organ than did the analog electronic organ, became increasingly popular. To evolve the digital technology being used, and to automate production of the associated circuit boards, Allen formed a subsidiary to support its production of digital organs. In August 1989, the St. James Vestry formed an Organ Search Committee, for the purpose of identifying an organ to replace the Allen TC-3S analog electronic organ. The Search Committee was headed by Derek Adnams and included other parishioners and the church organist Linda Shadel. In March 1990, after in-depth study, consideration of candidate organs, and much discussion, the committee recommended, and the Vestry agreed, that St. James Church would purchase an Allen MDS-45 digital electronic organ. In making this recommendation, the committee emphasized the point that additional circuit boards could be purchased for the organ to take advantage of future enhancements and upgrades developed by the Allen Company. The total price of $25,800.00 reflected a trade-in credit for the church’s Allen TC-3S Organ. The Allen MDS-45 Organ, which is still in use today, features the traditional two manuals, 61 notes, and a Card Reader to accommodate the 190 voices then available. It is interesting to note that St. James Church, despite the relatively small size of its congregation, has always integrated the latest technology, pipeless organ music into their religious services. First, they used a state-of-the-art reed organ; later, the then current state-of-the-art first generation electro-mechanical tone-wheel Hammond Organ; followed by the first generation analog electronic Allen Organ, and now the first generation digital electronic Allen Organ. It is clear that the Music Ministry is, and always has been, recognized to be a very important element of religious worship at St. James Church. Three of the very beautiful stained glass windows of St. James Church were created by the German firm, the Zettler Studios, and obtained through their New York City office. These stained glass windows are entitled “Christ the Comforter,” “Chalice and Host,” and “Agnus Dei.” The window, “Christ the Comforter,” which today continues to prominently occupy the space above the altar and is admired by the parishioners of St. James, was dedicated by the first Rector of St. James, Father Harry Hadley, during the 8:00 am celebration of the Holy Eucharist on May 16th 1948. The window features deep blues and reds as the predominate colors. As is generally the case with Zettler stained glass creations, Christ’s halo is a cruciform halo. It was noted by Father Hadley that the colors in the window harmonize with the other sanctuary windows created by the same company; namely, the “Agnus Dei” and the “Chalice and the Host.” As a result of the later additions and renovations of the Sanctuary, those two windows were relocated to the Circumferential Hall and are mounted just opposite the two entrances to the Sanctuary. One of the traditions resurrected during the Gothic Revival was the creation of stained glass windows. The roots for the Zettler Studies reach back to 1862 when Joseph Gabriel Mayer added stained glass production to his Institute for Christian Art Works. The firm’s work became so popular in the United States that by 1888 it had opened an office in New York City. Joseph Mayer’s son-in-law, Franz Xavier Zettler, originally worked in the window portion of the Mayer business before striking out on his own in 1870. In 1882, Franz Zettler’s company was appointed the “Royal Bavarian Art Institute for Stained Glass” by King Ludwig II, (also referred to as the “Mad King” – the builder of the fairy-tale-like Neuschwanstein Castle). Both the Mayer and Zettler Studios perfected what became known as the “Munich Style.” In this method, religious subjects and scenes were painted on larger sheets of glass, and then fused to the glass by firing the painted glass at very high temperatures, thus allowing for a blending of colors previously not attainable. In the windows of the Munich Style, the leaded seams did not interrupt or intrude upon the scene portrayed, but rather were camouflaged in such a way that they became hardly noticeable. The new style also allowed for extremely detailed depictions of their subjects. Zettler and his Royal Bavarian Art Institute became well known for the quality of their designs, clearness of glass despite the rich use of colors, and harmonious decorative effects. The windows are particularly well known for the depth of their reds and blues – something very evident in all three of the Zettler stained glass windows of St. James Church. The firm also gained a reputation for technological innovations and familiarity with Christian iconography. For example, Christ’s halo is generally a cruciform halo and Mary’s halo often contains stars; saints are normally shown with their personal symbols. Zettler windows appear in thousands of churches in the United States, especially those founded by European immigrants. In 1939, the Zettler and Mayer Companies merged their operations; the resultant merged company continues to do business today. During the spring of 1976, the beautiful metal art, stained glass, entrance doors of St. James Church were designed, fabricated and installed by The Baut Studios, located in Swoyersville, PA. The Metal Art Glass Panels, a patented design of The Baut Studios, are ½ inch thick and use aluminum extrusions manufactured by the Kawneer Aluminum Company. In accordance with the contract, the stained glass inserts are made of the “finest mouth-blown antique glass” then available. In 1988, the doors were back-lighted to enhance their beauty when viewed in the evening. Also in 1988, St. James contracted with The Baut Studios to repair, reframe, and re-install the stained glass windows of the Nave, using their patented extruded aluminum window design, thereby considerably extending the expected life-time for those beautiful old windows, all of which date back to at least 1955, and most probably to the late 1930’s or early 1940’s. The Baut Studios were founded in 1927 by Stanley Baut and employed a staff of two to four stained glass craftsmen, depending on the volume of his business. Stanley’s son Eugene, who worked at his father’s side from the age of six and had become an accomplished stained glass craftsman prior to entering the military service during World War II, became a partner in his father’s business in 1945. From that time on, due to the vision and dedication of Eugene Baut, the business grew in physical size, staff, and product depth. “Gene,” an inquisitive thinker, earned a number of patents during his career, including a key patent for “A Structural Stained Glass Window System.” Since all doors are custom-made, Father D. Stewart Alexy, then Rector of St. James, worked directly with Gene and the other craftsmen of The Baut Studios on all aspects of the design and artwork for the main entrance doors of St. James Church. By 1976, when the entrance doors for St. James were acquired, The Baut Studios had already gained a strong regional reputation for fabricating high quality, custom-made, stained glass windows and doors for the religious market. Today, The Baut Studios are renowned worldwide. Later in the life of the company, Gene became disappointed in the structural quality and responsiveness of the suppliers who provided the aluminum products needed by The Baut Studios for the fabrication of their doors; consequently, Gene invested in the design of his own dies for the needed aluminum extrusions. The Baut Studios now offer complete packages with all structural and decorative aspects handled by their in-house artists and engineers. Stained glass doors and windows, custom-designed and fabricated by The Baut Studios have been installed in a long list of cathedrals, basilicas, shrines, churches, museums, public buildings and schools worldwide, including the Vatican Embassies in Morocco and Romania and churches located in Bosnia, Guam, Liberia and the U.S. Virgin Islands. Baut’s Sculpture Department designed and fabricated a 36 inch bronze sculpture of Pope John Paul II which is now part of the Vatican Collection. Structural Stained Glass Door Panels, similar to those of St. James Church, were fabricated for the Cathedral of St. Thomas More in Arlington, Virginia. Upon the retirement of Father Harry Hadley on January 1st 1957, Father George Hall while still in his final year at the General Theological Seminary, in New York City, agreed to serve as Layman-in-Charge of St. James Parish. He served in that role until April 27th 1957 when he was made Deacon-in-Charge of St. James Church; he continued in that role until November 2nd 1957 when he was ordained a Priest by Bishop Alfred L. Banyard and named Rector of St. James. Father Hall continued to serve as Rector of St. James until October 31st 1961. After leaving St. James Church, he served as Rector of Calvary Church in Flemington, NJ from 1961 to 1969, and Rector of St. Luke’s Church in Glastonbury, CT from 1969 to 1992. From 1992 to 1995, Father Hall was a member of the Staff of the Litchfield Regional Ministry of the Connecticut Diocese and also served as Director of the “Oratory of the Little Way” in Gaylordsville, CT. From 1995 to 2000, he served as Priest-in-Charge of St. Marks Church in Bridgewater, CT. In 2006, after a short retirement, he accepted an assignment as Priest-in-Charge of All Saints Church in Wolcott, CT. Father Hall is once again retired; he was born on March 3rd 1930 and currently resides in Southbury, CT. In 1963, Paul C. Van Dyke wrote an arrangement of Joachim Neander’s famous Christian hymn, “Praise to the Lord, the Almighty, the King of Creation,” for organ accompanied by SATB (Soprano, Alto, Tenor, Bass) voices, which was published as part of the Harold Flammer Choral Series. Mr. Van Dyke dedicated that arrangement to “St. James Church, Bradley Beach, New Jersey and its Rector, The Rev. D. Stewart Alexy.” This arrangement was the anthem sung by the St. James Choir during the Centennial Eucharist celebrated by Bishop George E. Councell. Today, there are many vocal and instrumental arrangements of Neander’s hymn. Due to its popularity, the hymn is sung by many choral groups around the world. Paul Van Dyke wrote two arrangements of the hymn; the first which was dedicated to St. James Church and Father Alexy was copyrighted in April 1963; the second arrangement was copyrighted in September 1991. The current 1982 Episcopal Church Hymnal includes the famous Neander hymn as Hymn 390, and shows it being taken from “The Choral Book for England;” the music is attributed to the Erneuerten Gesangbuch. Hymn 390 has been sung a number of times during Eucharist services held at St. James Church. The Episcopal Hymnal also includes two other hymns having Neander connections. The music for Hymn 180: “He is Risen, he is risen,” is attributed to “Unser Herrscher” and was composed by Joachim Neander; the words for Hymn 665: “All my hope on God is founded” are based on wording by Neander. This attitude of friendliness continues to prevail at St. James today, where the parishioners and Rector are pleased to renew their welcomes not only to summer visitors, many of whom return year after year when spending their vacations “at the shore,” but also to our neighbors living in the nearby area. Parishioners take turns, on a weekly basis, greeting people as they enter St. James to participate in the religious services. In addition, on Friendship Sunday held in October of each year, parishioners are encouraged to bring a family member, friend, or neighbor to participate in either the 8:00 or 10:00 am Eucharist Service and also the period of fellowship and refreshments held in the undercroft immediately following those worship services. Mr. John E. Bird, Jr. and his wife Mary Beth had met The Reverend D. Stewart Alexy when he served as Rector of their parish at St. Mark’s Church in Pittsburgh. Father Alexy had presented Mary Beth for Confirmation and had presided at their marriage; over the years, the Birds had developed a strong and lasting relationship with Father Alexy and his wife Sally. After Father Alexy accepted his first call to serve as Rector of St. James, John Bird began to sense a vocation to the priesthood and contacted Father Alexy as he sorted out his feelings and began to explore the requirements for ordained ministry, the first of which was a college education. Father Alexy suggested that John include Monmouth College among his applications because summer work would be readily available at the shore, and he could provide John with experience in parish life while in school. Mary Beth and John moved to Bradley Beach in the summer of 1962 and John began his studies at Monmouth College that summer; Mary Beth worked as a medical secretary for Wallace Laboratories in Cranbury, NJ. During the summers, John worked at the “All Auto Parts Company,” located on Summerfield Avenue in Asbury Park, a store owned by a member of St. James Church. John later received a BA degree from Monmouth College in 1966. Throughout his college years, John was active in the religious activities of St. James teaching Sunday School classes and Lenten adult classes; he also occasionally spoke at Sunday Services, and served as sub-deacon for major feasts. He and his wife, Mary Beth, enjoyed and participated fully in the life of St. James Parish. They formed many long-lasting friendships during those years, and were thrilled to renew them when they returned to the area twenty years later, when Father Bird answered the call to serve as Rector of St. Uriel’s in Sea Girt. Father Bird received a Masters in Divinity from Philadelphia Divinity School in 1969 and a Doctor of Ministry from Virginia Theological Seminary in 1993. He was ordained a priest on October 25th 1969 by Right Reverend Alfred L. Banyard, Bishop of the Diocese of NJ, with Father Alexy serving as his presenter. After ordination, Father Bird served as Curate of Christ Church in Woodbury, NJ from 1969 to 1975. Much to Father Bird’s surprise, Father Alexy was among the congregation when Father Bird celebrated his first Holy Eucharist at Christ Church. From 1975 to 1983, Father Bird served as Rector of the Church of St. Luke and The Epiphany in Philadelphia, PA. In March 1977, the St. James Vestry approved Father Alexy’s request that when St. James Church received its copies of the new Proposed Book of Common Prayer, the copies of Rite One, then being used by St. James Church, would be sent to Father Bird’s church in Philadelphia for their use. At the end of his Rectorship in Philadelphia, Father Bird was called to be Rector of the Church of the Good Shepherd in Jacksonville, FL, a post he held from 1983 to 1988. During those years, he began his work on a Doctorate in Ministry from the Virginia Theological Seminary. As he was completing his doctorate, Father Bird received a call to return to NJ as Rector of St. Uriel The Archangel Church, in Sea Girt; a post he held from 1988 to 1998. He retired in 1998 and currently resides in Woodbury, NJ where he serves as an assisting priest at Christ Church – the church of his first assignment in the priesthood. St. James Church was honored by Father Bird’s agreement to accept Father Goss’ invitation to provide one of the lectures during the Parish Retreat, held on February 21st 2011; this Retreat was the first event held to commemorate the Centennial of St. James Church. Reverend Gail Bennett is the first member of St. James Parish to be ordained a Vocational Deacon of the Episcopal Church. Gail also had the honor of being selected as a member of the first Diocesan Vocational Diaconate postulant class, which was initiated in February 1982. Following successful completion of those studies, she was ordained a Deacon by Bishop G. P. Mellick Belshaw on April 13th 1985. 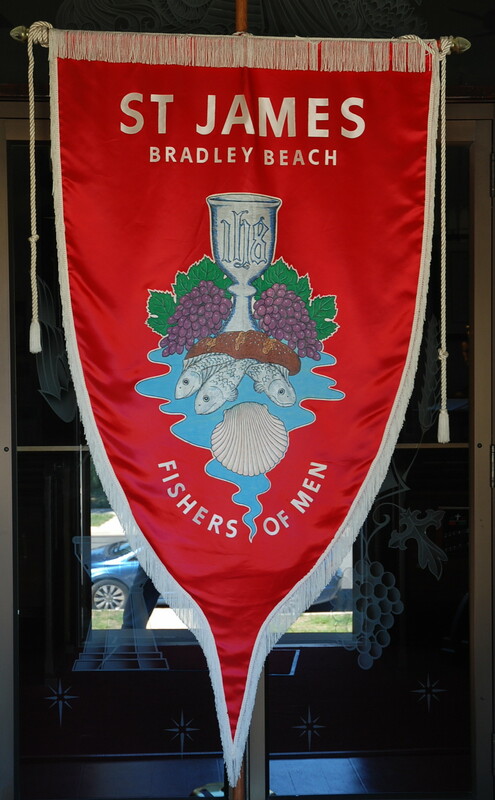 The “Fishers of Men” banner of St. James Church in Bradley Beach was created, by Judith Menut of the Parish, to enable St. James to properly participate in the Procession of Parishes, which was associated with Gail’s Diaconate ordination held in Trinity Cathedral. The banner of St. James Church was proudly carried in that procession by Miss Holly Moore (now Mrs. Holly Toohey). From the time of her ordination in 1985 until 2004, Reverend Gail Bennett served as Deacon/Assistant in her home parish of St. James, in Bradley Beach. In 2005, she accepted an assignment to Trinity Church in Asbury Park where she serves as Deacon and Assistant for Pastoral Care. After years of serving as a volunteer hospital chaplain, Deacon Bennett also now serves as a hospice chaplain. Her stated strong desire is to bring awareness of the poor, the lonely, and those in need, to the wider congregation. Prior to her assignment at Trinity Church, Gail was a long-time member of St. James Church having joined the Parish in 1942, at the age of four years. As a youngster, she fully participated in all Sunday School activities; in addition, she was a charter member of the Girls Choir that was organized and directed by Betty Savoth and Ann Darnell. As a young adult, Gail taught Sunday School for a number of years and also started the practice of awarding God and Country Badges to the Boy Scouts of the Parish on Scouting Sunday. In addition to organizing that program and teaching some of the classes, she mentored two boys from the Parish who were pursuing the award. Gail was later joined in the God and Country award program by parishioner Laurie McClellan, then a Commissioner of the Monmouth Council of the Boy Scouts of America. After her ordination, Deacon Bennett served, at various times, as a Chaplain for the Monmouth Council’s Scout Reservation in Forestburg, New York. While a lay member of the parish, Gail served as a member of the Altar Guild, and was also very active in St. Martha’s Guild – serving both as President and Treasurer of that Guild. For many years, she was an active participant in the Lay Ministry of St. James, serving both as a Chalice Bearer and Lay Reader. Gail served on the Vestry from 1976 through 1981, and as Treasurer for the Vestry from February 1977 through January 1982. Prior to her ordination, four times Gail actively participated as a member of the Diocesan Mission to the Republic of Haiti. On her first visit to Haiti, in the summer of 1980, Gail was joined by Dawn Wilson (now Dawn Taylor) – the current teacher for the St. James Sunday School’s Pre-Kindergarten class. As a result of these many and varied activities as a lay member of St. James, Gail was well prepared to serve effectively as Deacon/Assistant for St. James Parish – which she did for almost twenty years (1985 to 2004). During the 9/11 Recovery Operations, Deacon Bennett worked as a Chaplain at Ground Zero for a period of nine months. Although not a part of the support operations at St Paul’s Chapel, near Ground Zero, Gail recognized their urgent need for additional volunteers and consequently made a recommendation to the Rector (Father Gluckow) that St. James consider organizing a team of volunteers to support the work of St. Paul’s Chapel (which members of the Parish subsequently did in an outstanding manner). September 11th 2001 forever will be remembered as the day on which a series of coordinated terrorist attacks were lodged against the United States. The terrorist attack against New York City, involving two high jacked commercial aircraft being flown into the Twin Towers of the World Trade Center, resulted in over 2,750 deaths, a large number of which were residents of Monmouth County. This event certainly brought the potential consequences of terrorism into sharp focus in the minds of the parishioners of St. James Church. At a special Prayer Service, held on the night of September 11th, (that was organized quickly and without the benefit of any advanced notice to potential participants), St. James Church was filled to “Standing Room Only” capacity as its members and the people in nearby communities turned to churches, like St. James, as a source for consolation. Weekly Prayer Services at St. James continued for a number of months after the tragic event. As is usually the case, Americans quickly and forcibly unite to provide the strongest possible response to the elimination of dangers and casualty recovery. Members of St. James Parish distinguished themselves as part of a 9/11 united response. Located directly across from the Trade Center site, St. Paul’s Chapel quickly became the home for an extra-ordinary eight month volunteer relief effort providing round-the-clock support for the World Trade Center recovery workers. Part of the Episcopal Parish of Trinity Church, St. Paul’s Chapel is one of Manhattan’s oldest building in continuous use – and despite its location, it was not damaged during the Twin Towers attack. After learning of the support being provided by volunteers at St. Paul’s Chapel, a number of parishioners from St. James Church quickly joined in supporting the relief and recovery efforts at Ground Zero. Once a month, groups of between 16 and 19 parishioners traveled to St. Paul’s Chapel to work a 12-hour shift to serve the relief workers at Ground Zero. One of their tasks at the Chapel was to assist the many people who came by the site of the devastation to express their grief and reactions by enabling them to make notes on a large canvas which hung over the wrought iron fence of St. Paul’s Chapel. After the relief efforts at St. Paul’s Chapel were terminated, a significant sized piece of that annotated canvas was given to St. James Church, where it currently hangs on the wall near the west entrance to the Nave. St James Church was never short of volunteers to assist in the work at St. Paul’s Chapel; and consequently, St. James Church of Bradley Beach became known, by those at St. Paul’s, as one of the most dependable and faithful parishes in the area. Jesus walking by the Lake of Galilee saw Peter and his brother Andrew fishing, and He called them to come after Him promising to make them “fishers of men.” Continuing along the shore of the lake, He saw James and John, in a ship with Zebedee their father, mending their fishing nets; Jesus also called them to follow Him. They too left their nets and their father and followed Him. It is believed that before they had received their call, all four fishermen had come to the conviction that Jesus was indeed the Christ. 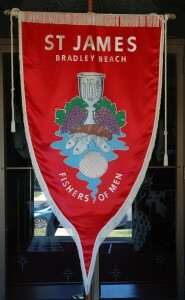 The “Fishers of Men” banner of St. James Church was designed and created in 1985 by Judith Menut as a gift to the Parish. As can be seen, it is derived from the above biblical reference to Jesus asking the apostles to become “fishers of men;” the banner also includes a scallop shell [or “cockle shell”], used frequently as an artistic reference to St. James. The banner was first carried by Holly Moore (Toohey), on April 13th 1985, in the Procession of Parishes at Trinity Cathedral, on the occasion of Deacon Gail Bennett’s ordination.